Let us tame your brows or remove other areas of unwanted facial hair with the ancient method of threading. Get beautifully smooth skin by scheduling your appointment today! Relax and rejuvenate with our body massages. At Unique Threading Salon we offer a range of massage services to help relieve your tense, tired muscles. 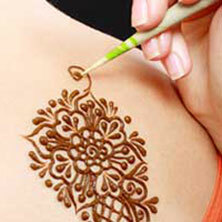 Henna is a unique way to express your inner beauty through delicate, hand applied patterns. We also offer eye brow tinting to add fullness and visibility to your brows. We offer both waxing and sugaring services to remove unwanted body hair. Try our sugaring services for a gentler and less painful alternative to traditional waxing.